- On the back of the neck is a dedication to the 75th anniversary of their home stadium, Estadio La Rosaleda (The Rose Garden). For me the standout feature of this shirt is the logo. I love the colouring effect that has been applied to the original logo. I do like it when a club logo is changed to suite to styling of the shirt. 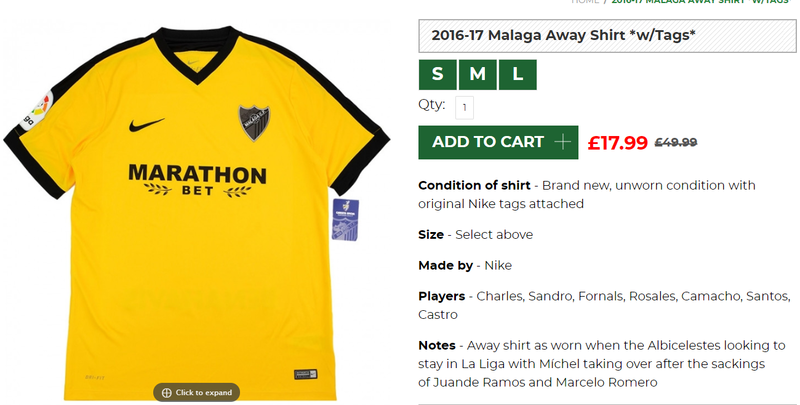 The yellow and black colour scheme is a nice choice, especially the with the black continually traveling from one side of the shirt to the other. Pedro Bazán has the record of goals scored in a single match of national category in Spain, scoring the 9 goals of the match of Second Division disputed between the CD Malaga and the Hercules CF on January 4, 1948 with a result of 9-2 favorable To the Malaga team.